People who have never been abused often wonder why a person wouldn’t just leave an abusive relationship. They don’t understand that leaving can be more complicated than it seems. Leaving is often the most dangerous time for a victim of abuse, because abuse is about power and control. When a victim leaves, they are taking control and threatening the abusive partner’s power, which could cause the abusive partner to retaliate in very destructive ways. Fear: A person may be afraid of what will happen if they decide to leave the relationship. Believing Abuse is Normal: A person may not know what a healthy relationship looks like, perhaps from growing up in an environment where abuse was common, and they may not recognize that their relationship is unhealthy. Fear of Being Outed: If someone is in an LGBTQ relationship and has not yet come out to everyone, their partner may threaten to reveal this secret. Embarrassment or Shame: It’s often difficult for someone to admit that they’ve been abused. They may feel they’ve done something wrong by becoming involved with an abusive partner. They may also worry that their friends and family will judge them. Low Self-Esteem: When an abusive partner constantly puts someone down and blames them for the abuse, it can be easy for the victim to believe those statements and think that the abuse is their fault. Love: So often, the victim feels love for their abusive partner. They may have children with them and want to maintain their family. 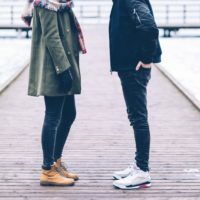 Abusive people can often be charming, especially at the beginning of a relationship, and the victim may hope that their partner will go back to being that person. They may only want the violence to stop, not for the relationship to end entirely. Cultural/Religious Reasons: Traditional gender roles supported by someone’s culture or religion may influence them to stay rather than end the relationship for fear of bringing shame upon their family. Language Barriers/Immigration Status: If a person is undocumented, they may fear that reporting the abuse will affect their immigration status. Also, if their first language isn’t English, it can be difficult to express the depth of their situation to others. Lack of Money/Resources: Financial abuse is common, and a victim may be financially dependent on their abusive partner. Without money, access to resources or even a place to go, it can seem impossible for them to leave the relationship. This feeling of helplessness can be especially strong if the person lives with their abusive partner. Disability: When someone is physically dependent on their abusive partner, they can feel that their well-being is connected to the relationship. This dependency could heavily influence their decision to stay in an abusive relationship. Numbers 21-30 from Sarah Buel’s “50 Obstacles to Leaving, or, Why Victims Stay” piece. If you know someone who is experiencing abuse, one of the most important things you can do is be there for them and offer support without judgment. Let them know that they deserve respect, and that the abuse is NOT their fault. Learn more about offering support to a friend or family member.